100% of our Māori learners had achieved at least NCEA Level 2 on leaving the school in 2014: achieving just as highly, or more highly, than non-Māori students. These are impressive statistics given the rate of perceived underachievement of our Māori learners nationwide. In response to a recent question posed to me, I’d like to share a little of what I believe contributes to this success. 200 minutes per week allocated to individual academic mentoring and support in a small tutorial (and vertically arranged) group. The tutor stays with one student for the three years of schooling. Wednesdays devoted to ‘impact projects’ where students discover, cultivate and develop their own learning interests. Impact projects are high stakes learning experiences which do not lead to NCEA credits (although this is, in theory, possible) but do provide fast-track career relevance and have led to numerous prestigious university scholarships. Students have engaged in post degree level study in some cases. ASHS is a senior high which means that we only have students from year 11, 12 and 13. We have learning commons instead of classrooms. These are large open plan areas where students from different year levels and subject disciplines learn in a shared space. We have conversations that focus on learning, on the things that ‘matter’ to us in our learning community*. Teachers are addressed by their first name. Students are tracked carefully and learning pathways are personalised by the tutor in conversation with home and the subject teachers. There are no prerequisites for any of our courses at any level and we do not set or stream classes. 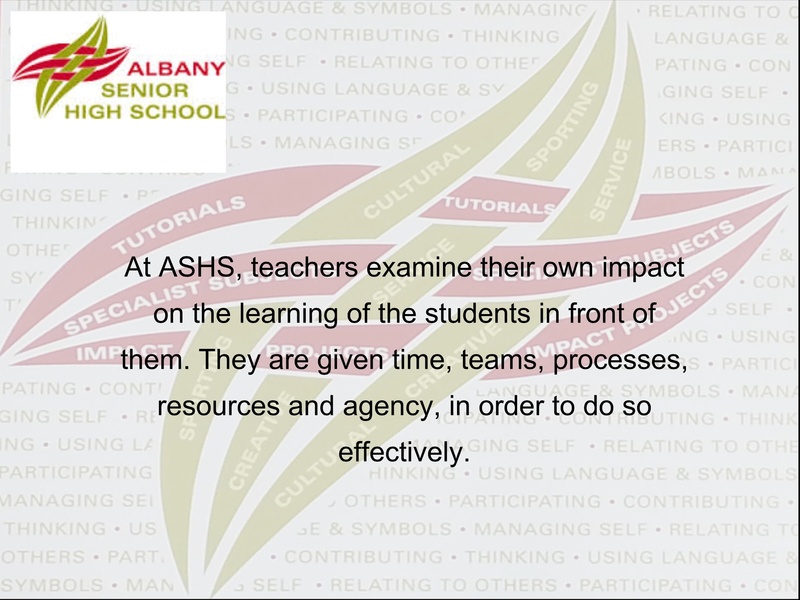 Albany Senior High School enjoys strong leadership, a clearly articulated, shared vision and core values that are founded upon the concepts of manaakitanga and whakawhanaungatanga. NCEA is run as it was intended: a strengths based curriculum where personalised learning is entirely possible. If it serves a student to focus on 18 quality credits at excellence in a subject instead of 26 at achieved, then why would we not enable that to happen. We are interested in excellence and we are interested in high standards of quality, deep learning that will serve our learners far beyond year 13. My role at ASHS is to be an English teacher, a team leader and very importantly, a tutor. Other than our principal, every teacher, including our deputy principals, is a tutor who spends 200 minutes per week with their tutorial class. This is because we want to keep numbers in each tutorial class to no more than 15. It is also because we believe that every child needs at least one adult who is an advocate in their learning. Ideally we engage with adults from the students family regularly (and we have phenomenally supportive and involved families at ASHS) but it isn’t always the case. Dealing with older teenagers can be a stressful time for families and vice versa. Sometimes, we are the only ones who are able to provide a stable advocacy. So we do. Being a tutor means that I know my Māori students well: I know who doesn’t wish to identify as Māori very publicly in a North Shore, largely Pākehā school. I know who is comfortable walking in two separate worlds, keeping her Māoritanga for home. I know who identifies with his non-Māori heritage more strongly than his other whakapapa. I know who is fluent in te reo Māori and who I can ask for advice in pronunciation as I learn the reo myself. I know who is Ngā Puhi first, Māori second and ‘New Zealander’ a very poor third. I know how to get support for my students who are learning te reo Māori and who want to be immersed in Kapa Haka. I have the sad knowledge of what it is like to attend the tangi of one of my student’s parents. And I know what these things mean for my students as individuals, as learners. I’m grateful to work in a system that affords me time to build relationships that are genuinely supportive of excellence. But what if you work in a school very different from the one I am describing? Well, if your Māori students are thriving, great! ASHS certainly isn’t the only school who can boast such success. Every context is different and our strength here in Aotearoa is that we have a charter to respond to our community foremost. One can’t hope to ‘borrow the good bits’, arrange them in a different context and hope for awesome outcomes! However, if you are concerned by the achievement of Māori students in your school I would urge you to consider the Te Kotahitanga guidelines. If you are in a school where you feel powerless against the senior leadership to make effective change, then change what you can – focus on those students in your own classes. Build respectful relationships with those students as individuals. Ask them how their learning is going. Listen to what is and is not said. Finally, talk with whānau. Build respectful relationships with whānau. It all comes down to this. We’re privileged that people trust us with their children. I think we should honour that trust by engaging in a genuine partnership. The power dynamic within this partnership has been imbalanced in the past. Schools and teachers may have been seen as the ‘authority’, with families very much having to defer to that model of hierarchy. I wonder if now, as agents of the crown, our role in the partnership is to listen. Listen hard. Keep listening. Then act together. *Some schools seem to spend an inordinate amount of energy, time, expertise and resources on uniform issues and hardly any, by comparison, on learning. 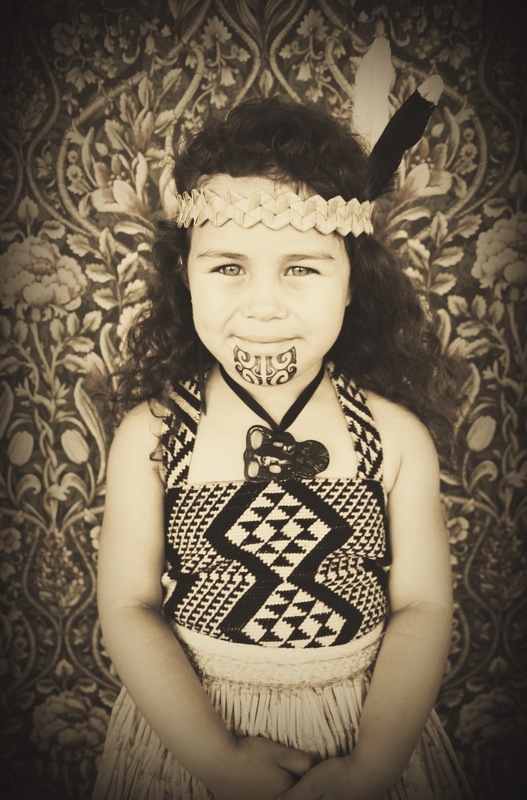 An excellent piece on Maori student achievement. Thanks so much Dianne! Your comments are appreciated and thanks for on-sharing the post, too. Tena koe Michaela, firstly congratulations to you and the rest of the ASH’ s staff on this achievement. Secondly, I thank you for unpacking and sharing your perspective on the design of this success. By opening the conversation of the “how” you demonstrate a willingness to welcome others into this conversation. If we are truly committed to the kaupapa of raising Maori student achievement then we must be willing to de-privatise the conversation to enable equity of that success to occur across all sectors of society. No reira, nga mihi.